Mammoth of the Thread Trophy | Artistry For Feminism. And Kittens. Sometimes WHTM commenters do something so spectacular it just wins the whole thread. But pallygirl thought it was missing something. Specifically, Rick Astley. 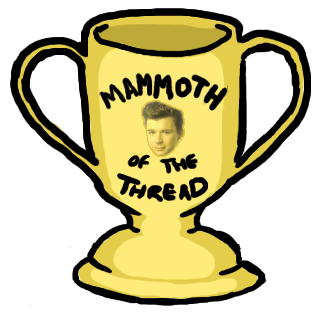 Please award either version to thread-winners as needed (using the imgur links), or let the winner decide by linking to this page.